Usually I like to keep my blog, this little space of the internet, pretty light and whimsical. I talk about hilarious cake catastrophes and cookie meltdowns, but lately I found it hard to be really happy go lucky. Lately I have felt like all my emotions have been quite fleeting, momentary, ephemeral - both positive ones and negative ones, but especially the positive. It has been difficult to really pinpoint what it is that is making me feel this way but I did figure out that if I kept myself busy enough with work or see enough people my mind gets distracted enough to not feel that way for a few moments. 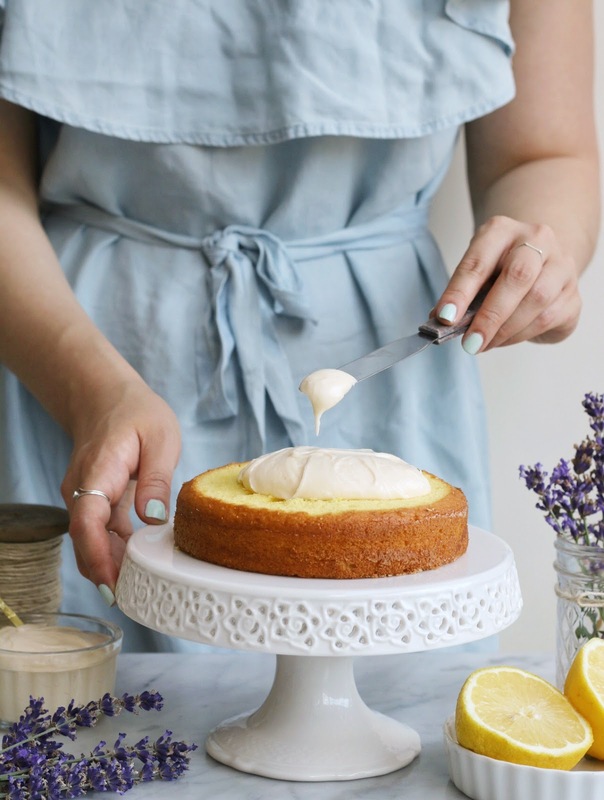 One of my favourite blogs to read and look for inspiration is my friend Thalia's blog, Butter and Brioche. Thalia not only has inspiring photos and recipes, but her writing...her writing is really special. In a recent post, Thalia mentioned a quote - “perhaps if I make myself write, I shall find out what’s wrong with me.” About a month or so ago, I bought a new mini journal that I keep with me in my purse wherever I go. I usually start my mornings with it, jotting down some stuff here and there while I drink my morning coffee. It has been quite helpful; it helps render things like feelings from being completely intangible to something more concrete. To something that is easier to process. So does any of this rambling have anything to do with this cake? Not really. I really contemplated talking about this here. I decided to do it purely out of selfish reasons. Perhaps writing about it here gives me an extra outlet for my thoughts to figure themselves out. 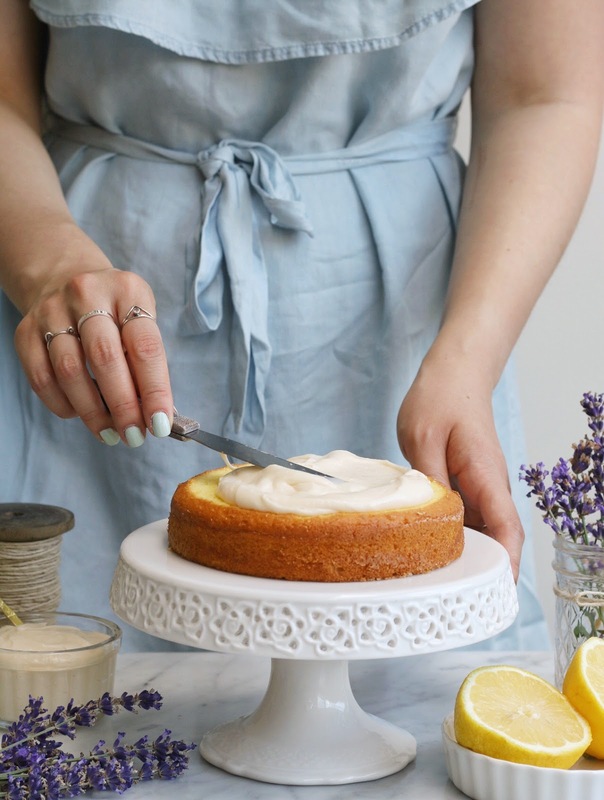 I made this lemon cake with lavender swiss meringue buttercream a week or so back. Maybe two. 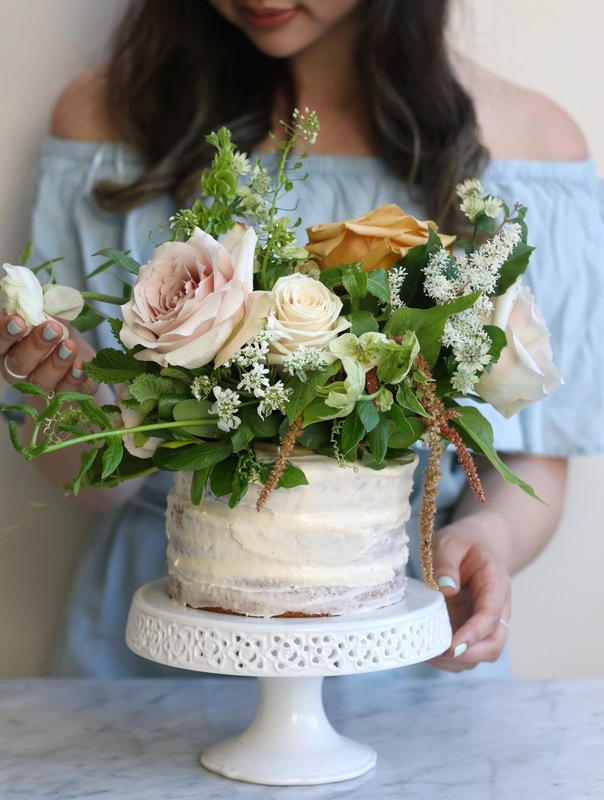 You might notice that the way the flowers are arranged on the cake is a little bit different from how I usually decorate my cakes. 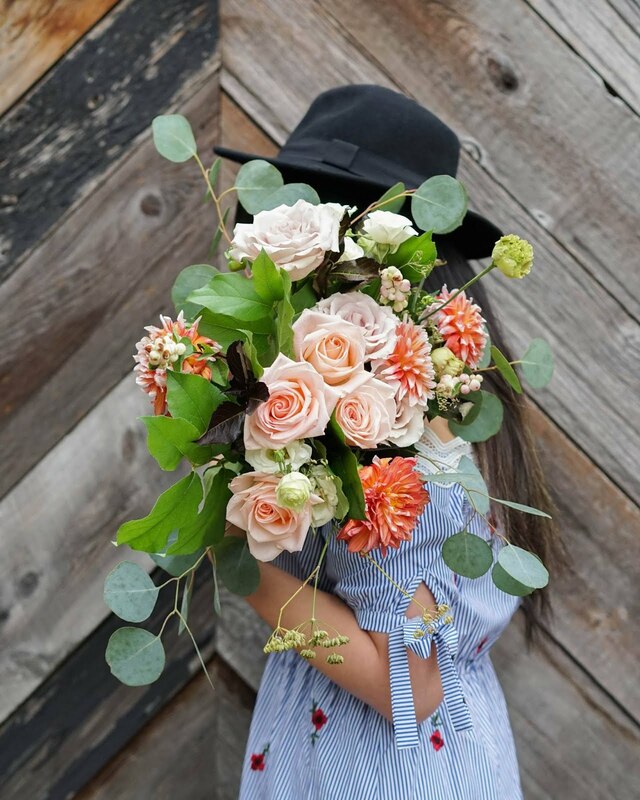 I have always been enamoured of the flower arrangements done by the florists of Celsia Floral. 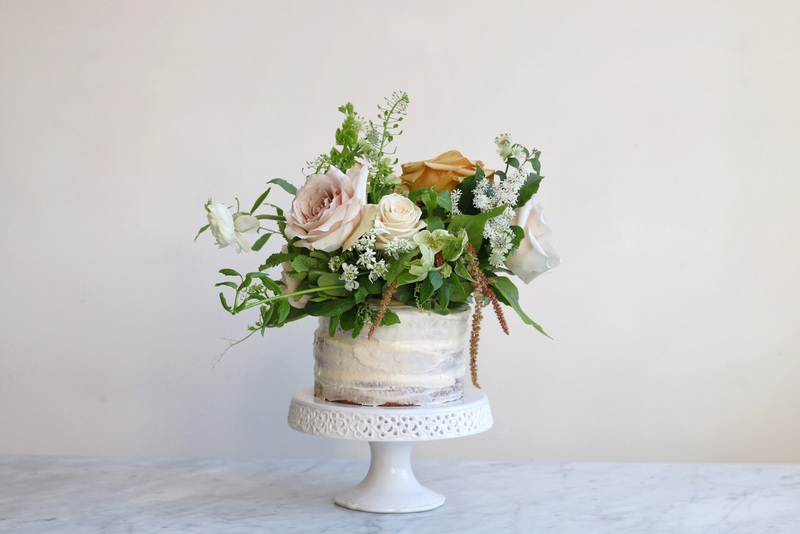 Through a different project, I was able to work with Eriko of Celsia Floral and have a custom cake topper made for my cake. 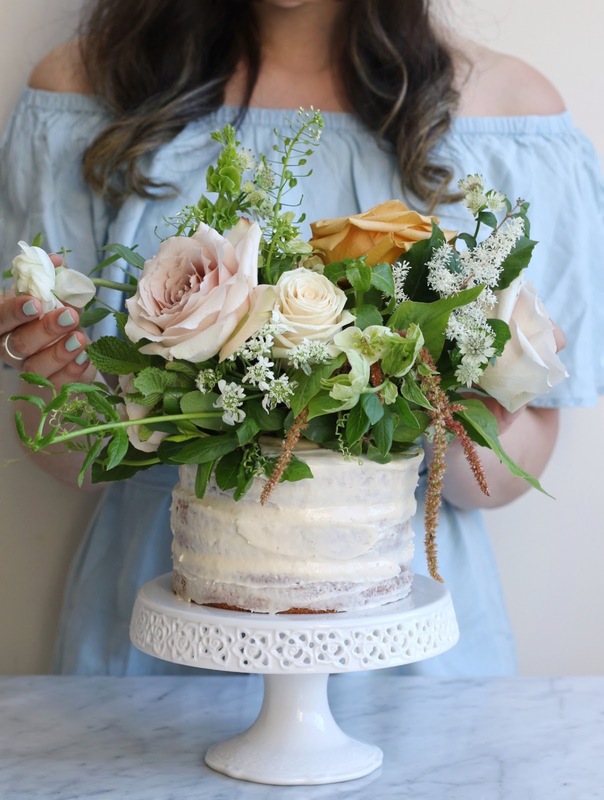 I told Eriko she could make whatever she thinks would suit my cake, with only a small request of pastels and cream-coloured roses. I love Eriko's creation so much. I love how it is both such a bold statement but done so with an oh so delicate arrangement. I love every single detail. 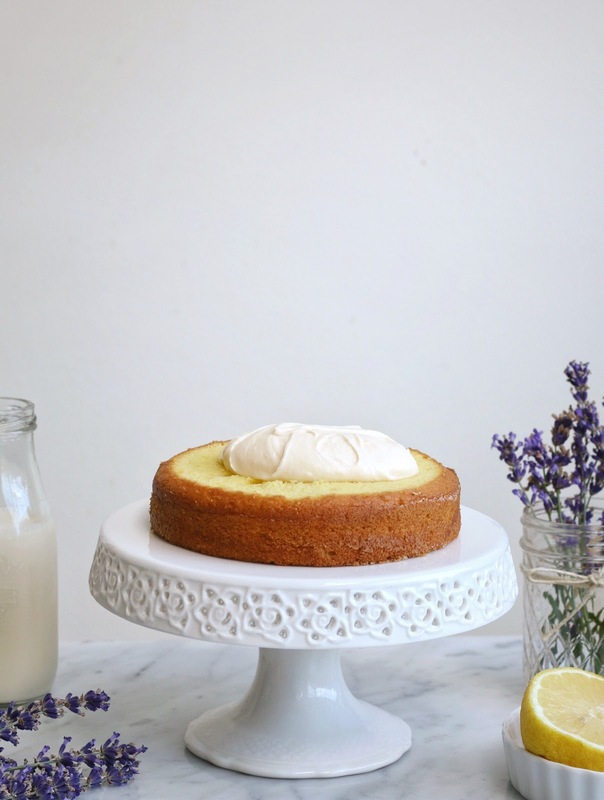 This is a cake of simple and delicate flavours - an uncomplicated lemon cake flavoured with lemon three ways - juice, zest, and pure lemon extract. 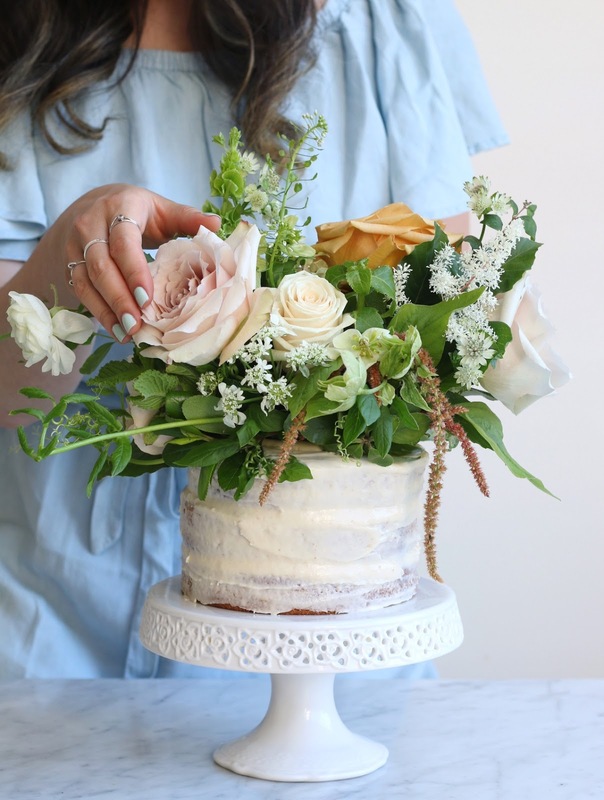 It is then topped with a light floral buttercream. I opted for a swiss meringue buttercream even though I feel like it requires a bit more effort. A Swiss meringue buttercream is a lighter and less sweet version of its traditional American counterpart. Swiss meringue buttercream is lightened up with the use of egg whites along with butter and sugar. Lavender can be a bit tricky. Too much of it and your buttercream will taste like soap. 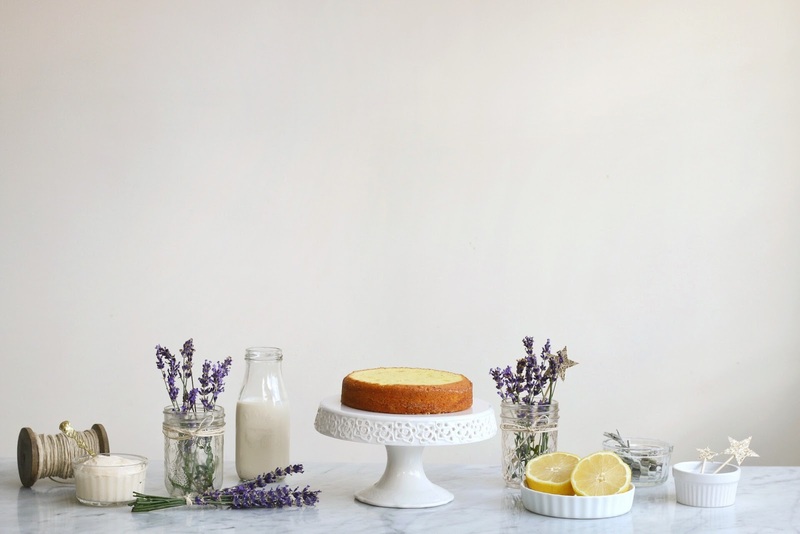 I like to add the lavender in small increments and taste it along the way. There are so many ways one can decorate this cake. 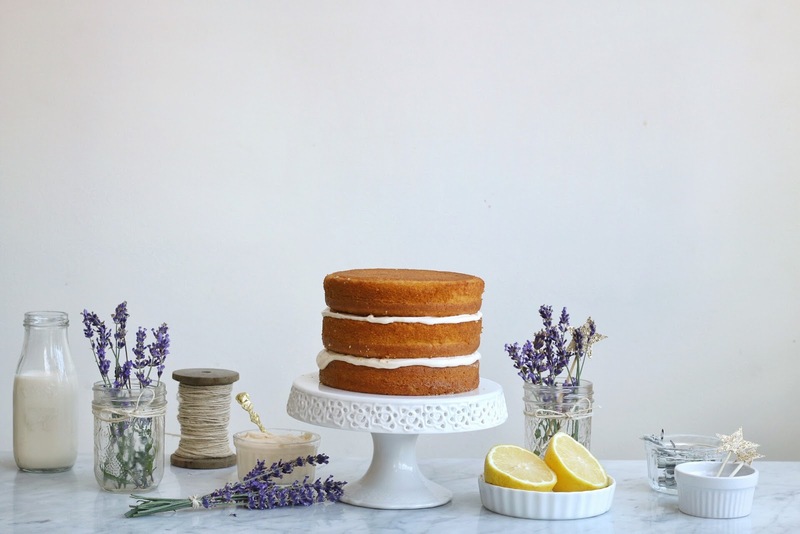 Before I received the cake topper, I started decorating the cake with fresh lavender stems. I had them arranged along the base of the cake and intended to have candied lemon slices on the top. 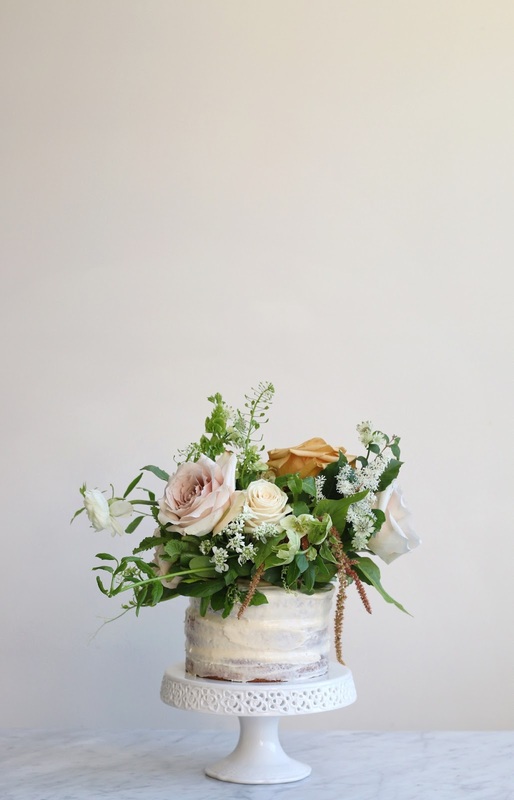 A simple cream-coloured rose or two on the side would be lovely as well. Preheat oven to 350F. Grease three cake pans and set aside. In a large bowl, whisk to combine flour, baking powder, baking soda, and salt. Set aside. In a small bowl, use your fingers to rub together the zest of one lemon with one cup of sugar, until sugar is fragrant. 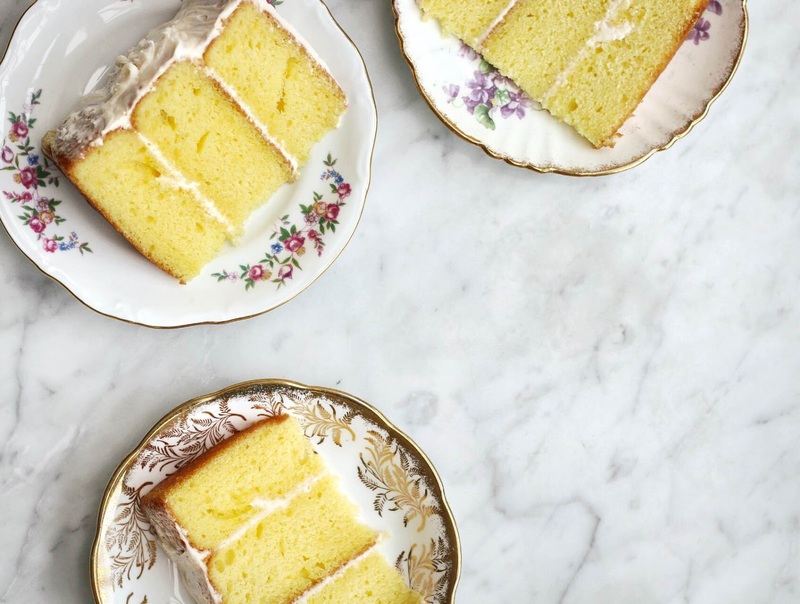 This step is optional but gives the cake an extra lemon-y boost. In a large mixing bowl, beat together the butter with the lemon-sugar until pale yellow and fluffy. Add eggs one at a time and beat mixture until it is well-incorporated. If you are adding the lemon extract, add it at this stage. Add half of the dry ingredients and half of the milk. Give the mixture a light mix before adding the remainder of the dry and wet ingredients. Mix until no more of the flour can be seen. Divide the mixture evenly among the three prepared cake pans and bake for 28-30 minutes. You can test for doneness by gently pressing your finger on the cake - it should spring back up. Let the cake layers cool completely before layering. Once the mixture has cooled a bit, start adding butter gradually. This is the part where you have to trust that the buttercream will turn out. It might look kind of lumpy and not buttercream-esque, but just keep on mixing and keep on believin'. I believe in you. 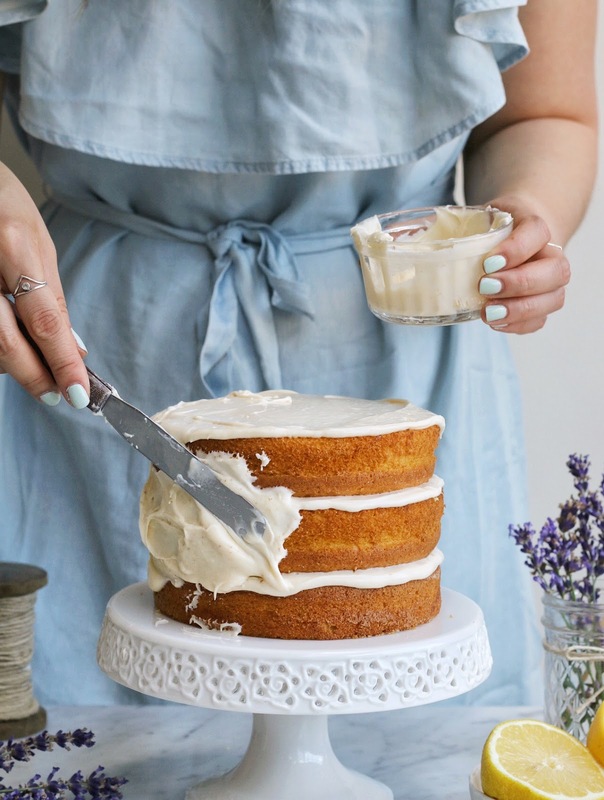 This cake is gorgeous and the lavender in the frosting sound amazing! PS your cakes are as pretty as ever, you are amazing lady! 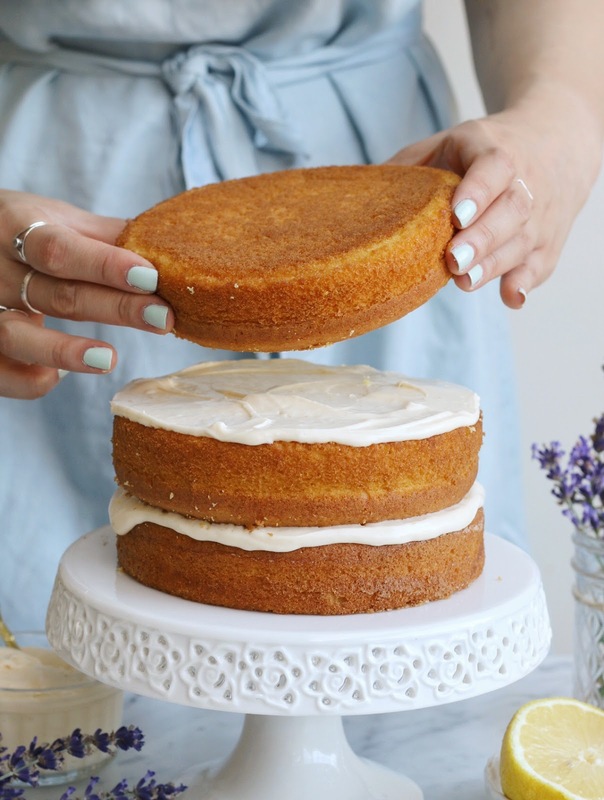 When do you add the vanilla and lavender to the buttercream? I don't see in the instructions. Thanks!